If all eyes weren’t previously on Chicago, they certainly are now. Last week, Mayor Rahm Emanuel was forced into the first runoff in Chicago history. He will now face Cook County Commissioner Chuy Garcia in an April runoff election. Garcia outperformed even his own polls (and also the wildest expectations of most people), getting well over 30% of the vote (although this might not sound like a lot, consider how the candidacies of the four challengers show that over half of the Chicagoans who voted disapprove of Rahm). A note before proceeding is that a vote for one of Rahm’s challengers did not necessarily equate to disapproval for Rahm. A lot of people voted against him simply so he would face a runoff, meaning that he would take his reelection more seriously (I have yet to see a single Rahm sign anywhere near UChicago’s campus; it’s possible this isn’t one of his strong areas but entirely neglecting it seems unwise). There are two schools of thought about these results and their national significance in relation to President Obama. The first views this as a shocking rejection of him in the very city he once represented. Obama endorsed Emanuel, and footage from his visit to Emanuel’s headquarters a couple of days before the election was in Rahm’s final TV ad. In addition to that, Obama’s presidential library will almost certainly be at UChicago (which I think is awesome; however, the bid is not without controversy, since it was originally planned to be built on land that the city didn’t technically own). Chuy originally slammed Rahm for supporting its construction in Chicago, but appears to have since walked back that criticism. So how is it that the very city that gave us Obama rejected a man who was his first Chief of Staff in the White House? The other line of thinking says that all of that is irrelevant, and that Obama is now a national figure, and it’s only natural for him to have grown apart from Chicago. I’d also add that it’s been a rough couple of months for candidates who have been seen as being close to Obama (although I do not necessarily view that as the reason for their political turmoils). Hawaii Governor Neil Abercrombie lost his primary last year to a little-known state senator, despite having Obama’s endorsement. Illinois Governor Pat Quinn lost to Republican Bruce Rauner last November (I was there for it; it was amazing) despite Obama coming to campaign for him. And now it was Rahm’s turn. Unlike the other two, he has a chance at redemption by winning the runoff. The third place finisher, Willie Wilson, said while he was at UChicago’s Institute of Politics that he would be supporting the challenger to Rahm, regardless of who it was. However, in his concession speech, he made it seem like he was up to changing his mind. Wilson and Chuy seem (to me) to agree on almost nothing. Chuy was the candidate of the Chicago Teachers Union, and Wilson was the most pro-school choice candidate running (with Rahm as a second). Although both attacked Rahm for closing the 50 worst-performing public schools in the city (which was the largest single closure in American history), they did so from very different angles. That’s why I view it as more sensible for Wilson to back Rahm. One of the biggest issues was the aforementioned school closure. I agree that it is obviously not an ideal situation, but what every candidate except Rahm ignored was the fact that 93% of the students who had been enrolled at one of those schools is now at a better performing school. In addition to what has previously been mentioned, this race is also nationally significant because of how teachers unions are going to play in the runoff. Now that it is Rahm vs. Chuy, teachers unions sense blood in the water, so to speak, and will go all out to defeat Rahm. Facing an unprecedented “fall,” teachers unions realize that if they can take Rahm down on April 7th that they will nationally be reenergized. However, if they lose, they may have crossed the point of no return. After all, if they can’t beat Rahm in a one-on-one matchup, when can they win? Teachers unions have seen battles on turf that has long been considered friendly territory, like California (where a challenger who was a former charter school executive only lost by 4 points to the teachers union-back incumbent) and New Jersey (where Cory Booker is a backer of school choice). There is no doubt that history was made in Chicago this past Tuesday. The question is, will it be made again on April 7th? This is an updated version of a post that appeared here earlier. 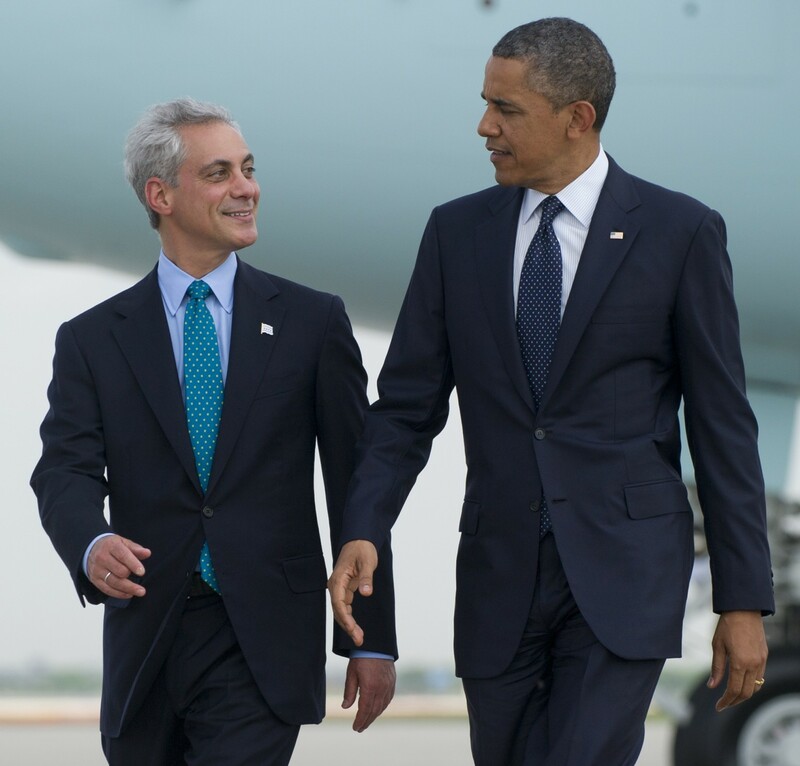 Will Rahm’s association with Obama be enough to carry him to a majority this April? We’ll see, but I think so.